Do you have a fireplace mantel or hearth that you don’t like? Did you know that you don’t have to live with it that way. You may be thinking that your only option is an expensive long process that would require breaking out the stone, brick, or marble and replacing it with something new but you would be wrong. I have the SOLUTION..!! Whether your mantel or hearth is wood, stone, or even marble, I CAN PAINT IT !! 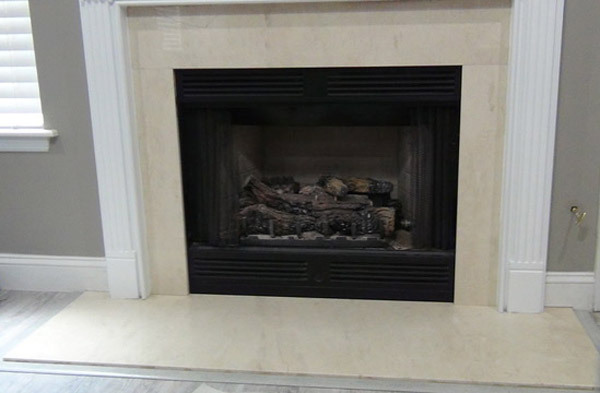 The photo below is a real travertine marble hearth that my client did not like. The color of the hearth clashed with the interior of the home. INSTEAD of tearing out the travertine marble and searching for the “right color and style” marble to be replaced I recreated the travertine marble to look like a fabulous imported grey and blue Breche’ Italian marble and in just two days. 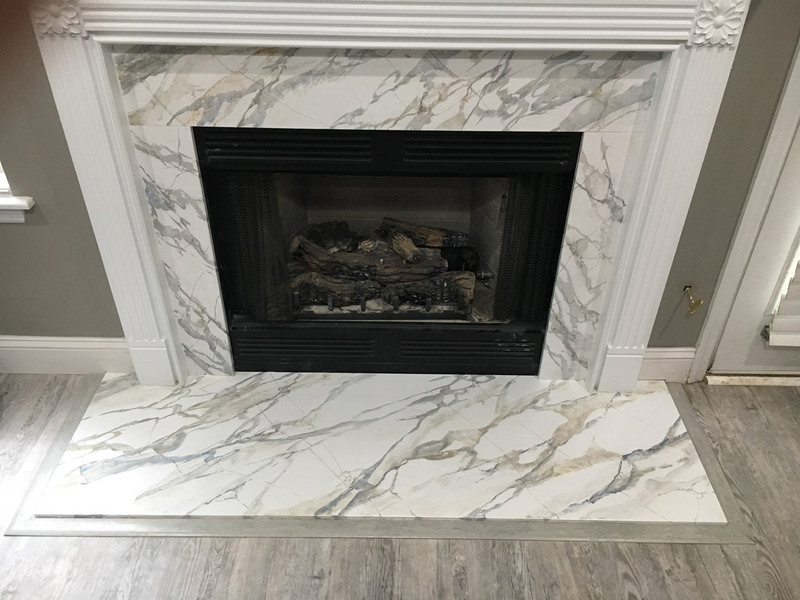 The labor and time involved in removing existing marble and wood mantel would have taken much longer and not have been cost effective. You may be wondering HOW is this possible? After years of trial and testing I have formulated a technique to allow myself to paint on existing stone and marble. The primer I have devised bonds perfectly to stone as it would to wood and plaster. I prepare the stone with a background color and then faux marble the surface and of course finish the painted surface with a very durable commercial grade water based clear coat. This faux painted marble has many benefits. You may choose just about any color or style you like while it would take weeks or months to garner a very expensive imported marble that fit your particular tastes and worked with your space. 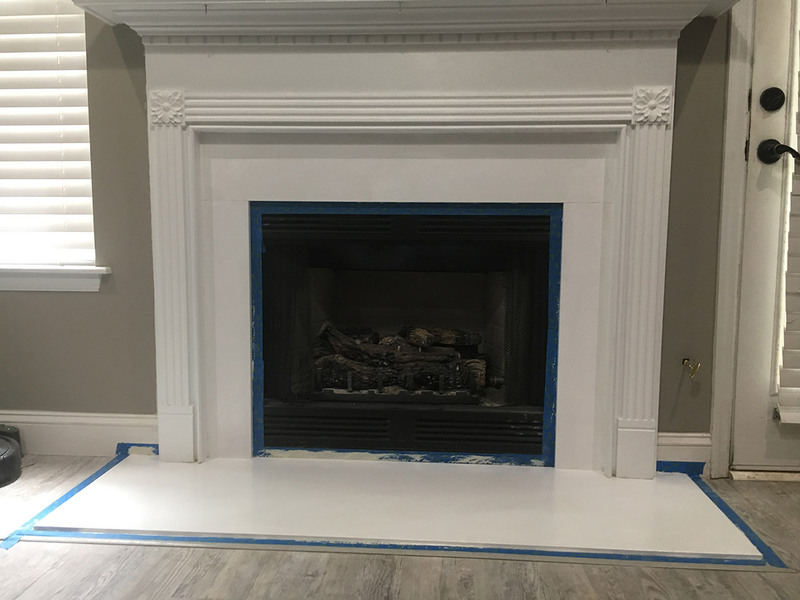 I also can paint a fire place mantel ( in most cases) in a couple days which is quite different from hunting down the material you want and then having it shipped to your location. No waiting for deliver or dusty dirty demolition of the old fireplace mantel. I have been doing this and many other faux painting techniques for over 30 years. Get in touch with me today and learn how I can transform your space into a place you love even more than you do now..